Objectives : running 3D-accelerated Vulkan demos on Linux CentOS/RHEL 7. Vulkan is the latest 3D graphics API, and is meant to supersede good ol' OpenGL after ~ 24 years of good use. There is a lot to write about "Why Vulkan ? ", but let's just say that it allows better control onto the GPU, along with better performance (requiring you to write lots more of code, though ;) ). One thing Vulkan definitely needs is hardware support. You need a Vulkan-compatible driver to use it, and on our beloved GNU/Linux, only Intel GPUs support it for now (it was added very recently, and only really works for 4 days now ;) ). The following steps are only known to work with Intel GPUs >= HD Graphics 4200 (such as those found in relatively recent Lenovo laptops). Do not spam-mail me if it does not work with your configuration ! The first version of CentOS 7 shipped with Linux kernel 3.10.0 rev.123, which does not support memfd. As memfd is heavily used within Intel's Vulkan implementation, we first need to upgrade to the latest 3.10.0 rev.327. 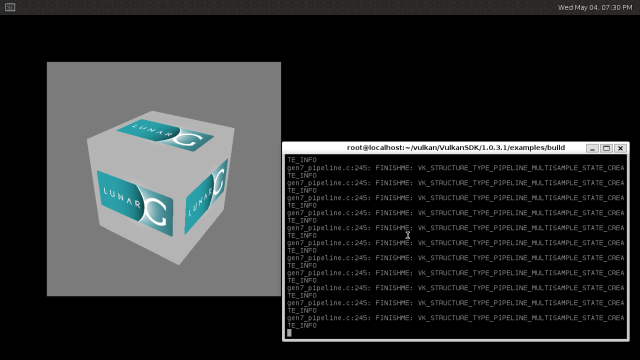 LunarG provides a cross-platform Vulkan SDK, which provides various binaries and sample code. To download it, click here, then scroll to the bottom, click on Linux, Download the Ubuntu package (no worries), agree to the license, and download the package to your home directory. You should see a whole log with GPU capabilities !